For most of us the one thing we don’t have enough of is… time! For many of us we are trying to achieve more, juggle more and do more. The danger is we run faster, work harder and work longer. The real danger is that we achieve less. Our productivity declines. You and I don’t have time to waste. We must be laser focused – like a heat seeking missile locked onto its target. How many times have you sat in a meeting with an enthusiastic prospective client only to discover they are junior and/or have no authority to buy? They can only say ‘no’. They are well meaning but can’t place an order. Some may even pretend they have authority to buy, but in reality don’t. You can waste too many hours talking to the wrong people. You must talk to Decision Makers. 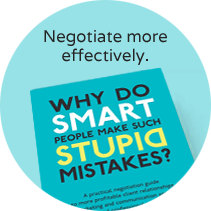 How many times in the past have you had a meeting with a prospective client and afterwards thought to yourself that you’d got the deal. Subsequently you discover you have wasted your time talking to someone junior? You have just wasted your time. Authority and approval levels to spend money have risen in many companies, sometimes to the Board. In many companies signing levels for anything of significant value must be signed off by the Board or a director. If that director doesn’t know you they are more likely to focus heavily on your price. I know I’m not alone in experiencing this. Many of my clients during my Negotiation or Trusted Adviser Selling workshops tell me that “messengers” are a huge problem for them too. My agency clients tell me this is a really common problem. In today’s economy the one thing you can’t afford to do is to waste time talking to the wrong person. Time is too precious. The drive for efficiency, effectiveness and results is relentless. You have to focus on priorities and on those business opportunities most likely to convert into a profitable win. So is it really such a problem dealing with a messenger? Surely they take your proposal to their boss with their recommendation to use you? Sometimes that may happen but I reckon it’s rarely that simple. Often their boss wants them to get several quotes from different suppliers. If the boss doesn’t know you the conversation between the messenger and decision maker is likely to become very focused on price. Because you haven’t had a chance to explain the specific advantages of your service or product, quotes from different suppliers are often commoditised or ‘benchmarked’. (Don’t expect the messenger will explain why your service, although more expensive, is superior because…….blah, blah)The more you think, and your clients think, that what you sell is a commodity, the more you will be bought predominantly on price. Why would a client pay more for your product or service? If you don’t have compelling reasons that resonate with the client, your service is easy to replicate and you have difficulty substantiating the benefits, then you will find it hard to charge a premium price. I appreciate price is an important factor for clients but it shouldn’t be the only factor. You don’t want to be the cheapest. You want to be the best so that your clients receive huge value from your work. Price then becomes a reflection of that value. Become very choosy! Be more selective who you meet with. Establish early on that they are senior and that they are the decision maker for the area under discussion. You don’t have time to waste on a wild goose chase! Qualify, qualify, qualify. Sometimes the messenger or gatekeeper insists you must deal with them. This makes it very difficult to target the senior decision maker. You have to decide whether to break the rules or not. Can you find a way to talk to the senior decision maker without alienating the messenger? It’s your choice, your decision. Weigh up the risks and the possible benefits. I know which decision I’d make! Don’t ignore the messengers or make an enemy of them. They can have considerable influence over the decision maker. You need to win them over to be ‘in your camp’. But you must talk direct to the decision maker. For many decision makers the pressure on their time has become greater and greater. Some of my senior clients go from meeting to meeting often with insufficient time to think and plan. They don’t have time to waste. So if you don’t grab them within the first 3 minutes you will find it difficult to retain their interest. You need a ‘James Bond intro’! James Bond films always start right in the thick of the action. They engage you from the very first moment. You are drawn in and sit on the edge of your seat. I suspect that after the first few minutes your pulse and blood pressure has raised. You’re engaged and want more. Do you think there might be a parallel with your prospects and existing clients. Can the latest James Bond film sit back on its laurels assuming you know how great the previous ones have been? No, every single time they must re-engage and so must we. In fact the bar probably get raised a little higher as our expectations increase. Will it be easy targeting Decision Makers? Especially senior Decision Makers? It will be harder but I believe it’s worth the effort and extra time involved. There are likely to be gate-keepers guarding their boss who can often be very protective. Some companies have a ‘no names policy’ so finding the right name can challenge even Sherlock Holmes. Because it’s hard for you, it’s hard for everyone else! So become a good detective. Find other sources of information. Find other non-traditional ways to identify the right person. Then give the Decision Maker a good reason, or two, to pay more. If you push to deal with Decision Makers I believe there will be five important benefits to you. Decision Makers have a big picture view of their organisation and its requirements making it easier for you to deepen your business relationship with them and add real impact to their business. Senior Decision Makers often have more than one budget and can move money between those budgets if necessary. Because you are more focused on your value and less on price your profitability and productivity will increase as conversion rates improve. Your confidence will grow as you become more successful – attracting yet more business. So how do we ensure we deal with senior Decision Makers? Make sure that what you sell is mission critical to your client’s business. Know how to articulate the business case, the ROI and payback. Raise your game so you can talk with expertise and confidence with senior business people. I help my clients plan and construct their conversations with the C-suite. So how much more careful will you be to avoid talking to a messenger?